Believe. It’s a motto Seattle Mariners’ reliever Brian Sweeney goes by. Believe in yourself, believe in God, just believe and you will be fine. On July 1, Sweeney, a native of Yonkers, N.Y., pitched at Yankee Stadium; a scoreless, 1-2-3 inning in which he got Ramiro Pena, Brett Gardner, and Derek Jeter out. He later went on to face the Yanks on July 11 in Seattle and got the likes of Alex Rodriguez, Mark Teixeira, and Nick Swisher out. At press time, Sweeney is 1-1 with a 3.68 ERA. But his story begins long before facing the Bronx Bombers. Sweeney recently talked to Yankee Yapping about his journey through baseball, where he learned his knee-buckling changeup, and how he was punk’d the night before he was called up to the big leagues. 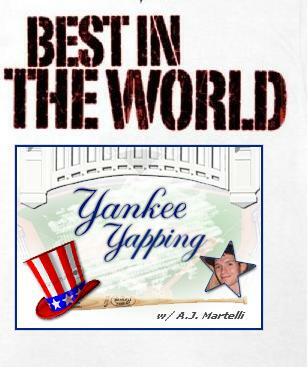 Yankee Yapping: You started at Archbishop Stepinac High School, and then moved on to Mercy College. Could you describe what it was like to pitch for the Flyers (now known as the Mavericks) and what did you major in while you were there? Brian Sweeney: Pitching for Mercy was an incredible learning experience. I learned about hard work, dedication and how important it was to not give in, no matter what the circumstance. Our records each season were not very good but it was not for lack of effort. I learned how to lose which is an important aspect in my professional life. Learning how to lose helped me want to win more! We lost off the field as well, because our assistant coach passed away in a car accident my freshman year. I also learned my changeup from my head coach at Mercy that I still use today. YY: Growing up, was there any specific team or player you looked up to? BS: I was a Yankee fan growing up and my idol was Don Mattingly. YY: You made your MLB debut for the Seattle Mariners on Aug. 16, 2003. What was your initial reaction when you got the call to the show? BS: There was an unbelievable feeling of satisfaction. I knew from when I was four years old that I wanted to be a professional baseball player. Granted I wanted to play shortstop for the Yankees, but after seven years of work in the minor leagues, I have finally accomplished my goal of getting to the big leagues. People spend seven years in school to become doctors and lawyers, but I would certainly say my schooling helped me become a big league baseball player. YY: After you spent a year with the Mariners, you went to San Diego to pitch for the Padres. What was the move like, going from the American League to the National League? BS: The move wasn’t a big deal, except I wanted to stay with the Mariners my whole career. They brought me up and I wanted to pay dividends for them. I guess I can do that now that I’m back in Seattle. Both San Diego and Seattle are classy organizations. I only wish they were closer to home for me and my family, though! YY: On May 7, 2006, you earned your first career save in a 6-3 Padres’ victory over the Chicago Cubs. As a relief pitcher, how did that feel and would you rather have a win or a save? BS: It was a pretty cool experience considering our closer was Trevor Hoffman. He had pitched, like, five days in a row and he had the day off so they put me in the closer role that day. Everybody in the stands expected Hoffy to run out of the bullpen, but they got me that day. All things winning are good, so I prefer both. YY: At the end of ’06 you made your way to Japan and pitched for the Nippon-Ham Fighters. The story in the Journal News said, “You could go on all day about the differences between pitching in Japan and the United States.” Is there anything that you miss about Japan, now that you’re back in the States? BS: I miss some of the drills that were conducted over there. For instance, they would put the pitchers at shortstop and it really was a great workout. I also miss some of my teammates. I played with Yu Darvish, who is an excellent player and a classy individual. Overall, it was a lot of fun to play in Japan. I would also say I miss the food there. It was tremendous! YY: This past April you came back, signed a deal with the Mariners, and then you were sent to the minors. Exactly two months later you were back in the majors. How did it feel to be back, considering you went right back to where you started (in Seattle) Was it a kind of homecoming for you? How happy were your teammates for you? Coming back and getting called up was satisfying, especially since I was able to go back to the Mariners–the team that bred me for seven years. It was like a homecoming, but I also had to get to know a lot of my teammates. The only one I really knew from my first stint with the Mariners was Ichiro. It was fun to catch up with him and we talked a lot about Japan. It was a learning process to get to know the rest of the players. It took some time, but I got to know them all. YY: Recently on July 1, you pitched at Yankee Stadium–a scoreless, 1-2-3 7th inning in which you got Ramiro Pena, Brett Gardner, and the legendary Derek Jeter out. Your family was there, holding signs that read “believe” on them. Could you maybe give me the story behind that, and what did it feel like to be pitching at Yankee Stadium against its most beloved player? Did you change your pitching approach when Jeter stepped into the box? BS: Believe is a word my children use (they are 11 and 6). It’s a strong word that means a lot and it pays dividends over time; believe in yourself, believe in God. My family jumped on that. They made signs that read “Believe” on them and it was meaningful to me that they did that. I later found out that the Mariners’ team expression is “Believe Big.” It’s just a positive word. I did the same thing with him that I did with the other hitters; same approach. Obviously he is one of the most celebrated ballplayers on the Yankees and he was a nice challenge. The only thing that was different about him was that he took a long time to get into the batter’s box. I wish he had gotten into the box a little faster! Maybe he was trying to slow me down? It could just be his routine. YY: At the moment your career record is 4-1. Of those four wins, which one would you say (if you can) was the most memorable, or rewarding? BS: My first win was certainly the most rewarding. On June 29, 2004, San Diego needed a starter to face the Arizona Diamondbacks–and not just the D’Backs, but Randy Johnson. Johnson had 3,992 career strikeouts and was going for 4,000. In that game, he got to 4,000 and I was two of them; I had to hit against him because it’s the N.L. We did however win the game 3-2 and it was a great feeling. The next day I actually met Randy and talked to him, which also made it memorable. YY: What’s the best story you have from being an MLB pitcher? When I interviewed John Flaherty (a former MLB catcher) he said he was hung over the day he was called up to the majors. Do you have a story like that? The night before I was called up I was out with a longtime roommate of mine. We had a few beers and then Jim Slaton, one of the coaches said, “I’m fired because the team isn’t pitching well.” I didn’t take it very well and had some choice words. Finally he stopped me and said, “Just kidding. You’re going to the big leagues tomorrow.” I practically passed out; all the work I put in had finally paid off. I was so happy, but I couldn’t get in touch with my dad right away because of the massive blackout that hit the east coast in the summer of 2003. I wanted my dad to be the first to know, because he was and still is a huge part of my success. Very enjoyable interview, A.J. Sweeney sounds like a really good guy, so I’m glad you got to talk to him! A.J. : I was at the game that day when Sweeney got out Pena, Gardner, and Jeet! It’s so cool that you guys went to the same college. I didn’t know he played in Japan!